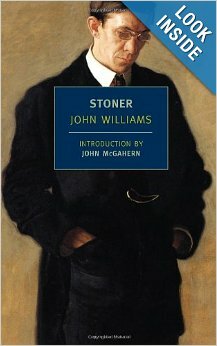 I just finished reading Stoner by John Williams. I can’t give a full account of how I feel about it since there hasn’t been enough time to fully process the story, but I do have a few quick thoughts. In keeping with a plot that covers most of a man’s life, Stoner is kind of like other stories such as The Curious Case of Benjamin Button, Citizen Kane, or Forrest Gump. On the other hand, it’s essentially the anti- Forrest Gump. Whereas Gump travels the world and only resides at his southern home from time-to-time (until the very end), the character of William Stoner stays in the same town for his whole adult life. Stoner is born, he lives, and he dies. The plot is comprised of his personal life and university life as an assistant professor. This sounds like a horribly boring novel, but it’s not. Stoner is a really entertaining read, but what keeps the pages turning isn’t just its entertainment value, it’s the nuggets of truth dispensed throughout the pages. …there would come to him the awareness of all that he did not know, of all that he had not read; and the serenity for which he labored was shattered as he realized the little time he had in life to read so much, to learn what he had to know. The True, the Good, the Beautiful. They’re just around the corner, in the next corridor; they’re in the next book, the one you haven’t read, or in the next stack, the one you haven’t got to. And so providence, or society, or fate, or whatever name you want to give it, has created this hovel for us, so that we can go in out of the storm. It’s for us that the University exists, for the dispossessed of the world; not for the students, not for the selfless pursuit of knowledge, not for any of the reasons that you hear. And this doesn’t even begin to scratch the surface of Stoner’s life. He enters a loveless marriage, draws the ire of a coworker who becomes his boss and mortal enemy, has a love affair, finds a true passion for teaching, and–as I’ve said before–dies. This may sound like a horribly depressing novel, but it’s not. By the end, when Stoner’s life is drawing to a close, the reader is filled with a sense of tranquility. Stoner never bears a grudge. In fact, I think he’s all too willing to forgive. He sticks by his morals, no matter what pain may come his way. Any difficulties thrown in his path are dealt with a stoicism that would have made Seneca proud. Stoner shows that loving your occupation and becoming good at it can fill a person with happiness. If, Lord willing, we are given long lives, we will probably leave this world in much the same way Stoner does. In reading this novel, a person is shown how important it is to love as much as possible right now, and–in the end–any slights that come our way are truly insignificant. Previous Post Should kids learn how to code?